Many podcasters have either heard about or heard from a site called podcasts.com, which has emailed a large number of podcasters offering free web hosting for podcasts. Unfortunately the company behind podcasts.com, Emerge Media(as found by my friend Jen and written about on podcasternews.com) went one step further, which was a step over the line into the unacceptable. It was discovered this weekend that podcasts.com had scraped many podcast feeds, stripped out any tracking being done via sites like podtrac and blubrry, and then linked directly to the source MP3 files on ad heavy pages. This is being done without permission, and without even requesting authorization. Worse then a common podcast directory, this company is taking people’s work, taking out the chances of making money, and then making money themselves off that work without paying the podcaster at all. It’s the worst kind of digital theft, because they point people at the files hosted by the creator, but without permission or the tracking many shows use for advertising. One thing was pointed out to me about podcasts.com last night, and further investigation showed that one thing I suspected helped turned out to be the linch pin. Dawnforge, you see, has always used Feedburner, and via settings that we have long used, the URL of our show files are obfuscated, so that the actual URL of the source file is not visible by scraping our feed. They can’t take off the tracking and point to the source because they can’t see it. Now, due to the many requests I got via Twitter, I am going to tell you how to do this for yourself to avoid being a victim of these bastards ever again. 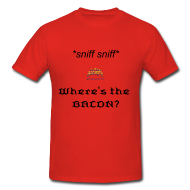 First, some preparations, though. What you should do is shift the location of your source files so that they cannot link to the old episodes, or I should say, if they do link to them, they won’t find anything. People using their site will get awfully pissed off if all the shows they try to access aren’t loading. 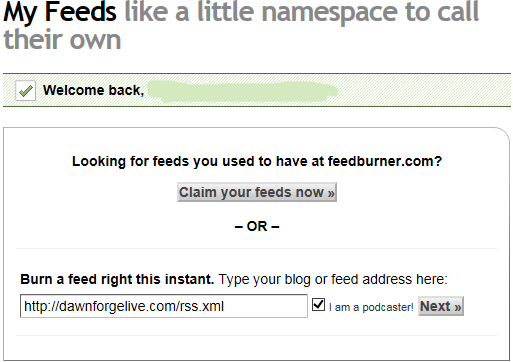 You should do the same thing for your RSS feed, as feedburner will need to source that raw feed in order to provide a more secure feed with masked URLs. Once those are changed, you should head over to http://feedburner.google.com/ which is the URL for the feedburner service since Google bought them. Once you are logged into a Google account, you will be given a chance to make a new feed, and there will be a check box that says ‘I’m a Podcaster’ as seen in the image below. 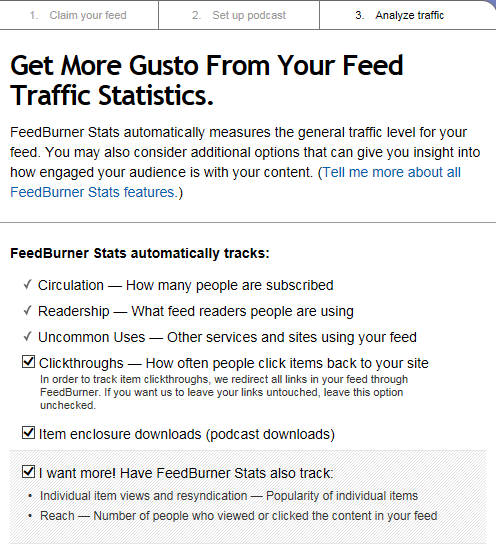 If you already have feedburner set up, this box will be at the bottom of your feed list. Once you have entered the RSS URL and hit next, you’ll be presented with the chance to customize the path of your feed. If you have full DNS control of your site, you can set up a url to point to the feedburner location, which can help maintain feed control in case Google ever turns evil. That, though, is for another time. As you declared yourself a podcaster, the next step is to setup your itunes feed info, which should pretty closely match what’s in your iTunes info now, but sadly it does not get imported. I do want to make a note here to advise that you should leave an nearly empty RSS file in the place of the old one, using the RSS redirect protocol described here. Once you have the iTunes details entered, hit next and you’ll be taken to the stats setup page. I should note here, that while I recommend checking all three available boxes, the key one won’t actually stick so we’ll need to go in set it a second time in our next step. Enter your settings as seen below and then hit next. BAM! You have masked download links via feedproxy.google.com. This should, at the least, prevent them from using your files without tracking, and if they respond to yours like they did mine, they will just drop your page as they can’t profit off your work anymore. I can’t guarantee that they will stop serving up your show, but it will mean they can’t strip out tracking you do, and they will be significantly less inclined, I promise. I hope this helps some of you out there who are feeling hard hit by these people at podcasts.com.